As the Oakland Center expands, more and more options are being added to the food court. While there were previously limited choices that made eating healthy a challenge, Plum Market offers multiple organic options for people looking to eat healthier. With its sleek, open kitchen and helpful staff, Plum Market looks and feels upscale, yet is inviting. There are multiple seating areas conveniently located by Plum Market now, making it a great place to grab lunch and meet up with friends. The main attraction of Plum Market is the rotating selection of foods, making it a place students can eat at often without getting bored of the selection. In a glass case, there are multiple salads and cold foods. They have classics such as pasta salads, as well as more unique ones, such as their artichoke and egg salad. When I tried Plum Market this week, I ordered the eggless egg salad and quinoa salad. The eggless egg salad was made out of tofu, with all of the other traditional egg salad ingredients, such as mustard and relish. It tasted just like the classic and is a great option for vegans, or anyone looking to try something new and delicious. The quinoa salad was also a great choice and included fresh veggies like radishes and bell peppers. Another unique aspect of Plum Market is their wall-to-wall cooler of drinks and more food options. They offer different dips and snacks, such as pimento cheese dip with pretzels, as well as hummus. They also offer international cuisine, with choices such as vegan samosas with mango chutney and mediterranean grape leaves. For someone looking for something more filling, Plum Market also has premade sandwiches. As students wait in line, they can browse the racks of snacks. There is a huge selection of granola bars with options such as Kind bars. They also have other snacks to take on the go, including popcorn. The range of drinks that are available make it a great option for students looking for pick me ups before classes, like cold brews or natural energy drinks. There are also plenty of choices for more unique drinks, including kombucha, which can be harder to find on campus. While the food selection is already great, the drink selection has so many diverse options. The drinks at Plum Market are an excellent alternative to the less healthy options around campus and are worth the walk to the Oakland Center. Overall, I give Plum Market four and half out of five stars. 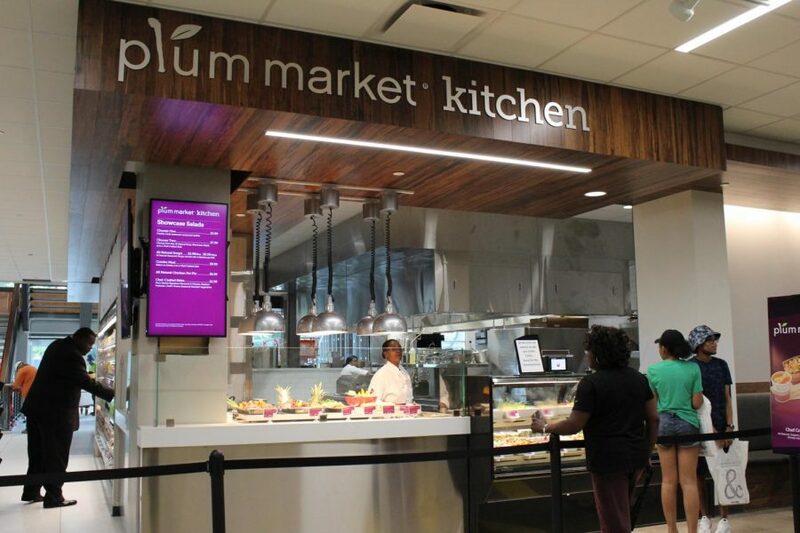 Since it can be a struggle for vegetarians and vegans to find food on campus, the addition of Plum Market is a huge bonus. It is a great choice for anyone looking to get fresh, healthy alternatives to other options on campus. While it can be a bit pricey depending on what you order, the quality of the food and drinks sold there make it worth the cost. Plum Market’s cuisine is a great way to mix up meals and avoid fast food.